Today's lesson is Moses gets water from the rock. The more I looked at this lesson, the water from a rock is only one paragraph! 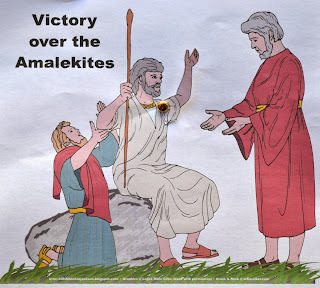 I concentrated more on the victory over the Amalekites. Which is interesting. There are so many different ways to go with the victory. God takes care of Moses and the Israelites, his friends watch over him and help Moses when he needs it, they fight the battle together... Anyway, there is so much we can learn from this one! Review: We have been studying about Moses. The lessons are found in the book of Exodus, which Moses wrote. We talked about the 10 plagues and about Pharaoh finally letting the people go. They crossed the Red Sea on dry ground after the water rose up on both sides for the people to walk over. Then the people complained about being hungry. God said He would take care of the people and He sent food for them to eat. In the mornings, the people had manna, which they collected every morning, except for the 6th day. 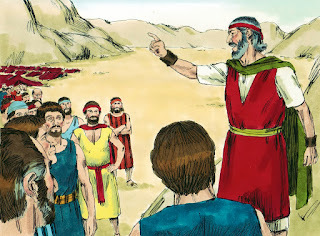 On the 6th day, they collected enough for 2 days, because the 7th day was the Sabbath Day and they rested on that day. The manna was little round white seeds that they could eat, or grind together and make bread. They also had quail in the evenings. Lesson is found in Exodus 17-18: As the Israelites were traveling, they complained about being thirsty. They asked Moses why he brought them out of Egypt, if they were just going to die from thirst! Moses asked God what he was supposed to do... the people were about to stone him! God told Moses that He would be at the rock in Horeb. Moses was supposed to hit the rock and God would send water out of it for the people to drink. (17:6) So, God took care of the people again! Now, God is going to watch over the people again. 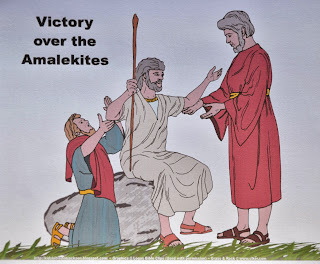 Moses told Joshua to "Pick some men to go with you to fight Amalek." 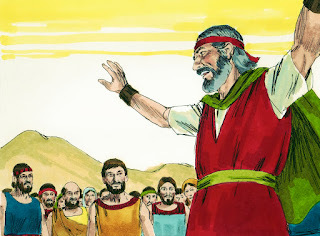 Moses also told Joshua that he would go to the top of the hill and have the 'rod of God' in his hand. When Moses became so tired and his hand so heavy he couldn't hold it up anymore, Aaron and Hur found a stone and sat Moses down on it. Then, they stood on each side of Moses and held up his arms! Until the sun went down! 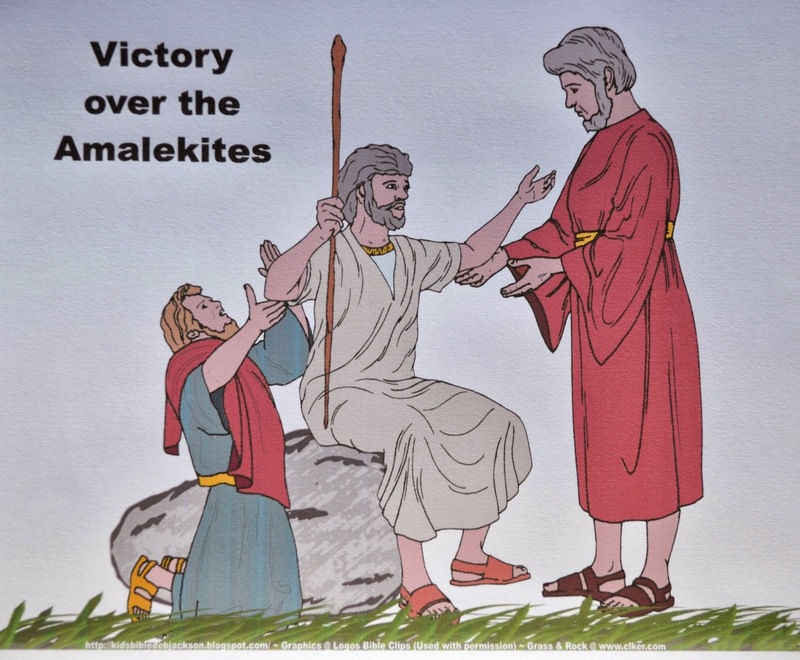 Joshua and the Israelites won the battle against the Amalekites! 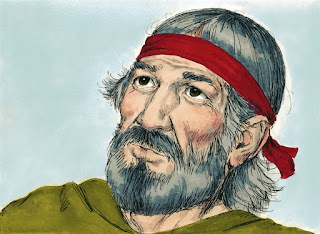 Jethro was the father-in-law of Moses. Remember, Moses married Zipporah? Jethro brought Zipporah and the 2 sons of Moses, Gershom & Eliezer, to be with Moses. While Jethro was visiting with Moses, he saw that there were people lined up to see Moses all day, until evening! Moses told Jethro that the people come to him with problems and questions. Jethro told Moses that it was too much for Moses to do by himself, and he needed to have other men know God's rules and let others help him. Moses listened to Jethro, and put men in charge to judge the people's problems, and they brought the really hard problems to Moses. Next week Moses will go to Mt. Sinai and God will give him the 10 commandments. For this lesson, I purchased this bag of smooth rocks at the Dollar Tree. (Remember to keep the mesh bag for fish net projects for the kids) I had the white paint marker from another project purchased at Hobby Lobby. I wrote 'PROVIDES" on them. I will let the kids pick a rock, and write "GOD" on the other side with a Sharpie. Kids love rocks! I also hand out a mini bottle of water. I wanted a project that would make the kids think about all the things that God provides for us. I printed the first page onto color cardstock, then printed the second page onto regular paper. Some of the pictures won't apply, so the kids can cut and glue what applies for them. Also, you can use pictures from magazines, newspaper ads if you do not want to print the second page. 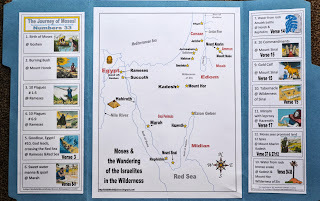 I reviewed how God had been taking care of the Israelites while we worked on this project. Click on the above heart to print. There are a couple of choices for this printable. You can click here to print this just like the above picture to use as a visual or a handout. Click here to print the same picture to color in black & white. 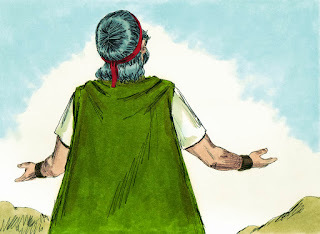 This is the same picture, but the arm of Moses needs to be cut and a brad used to make the arm able to go up and down, since his arm kept falling down. Click here to print the color version. Click here for the black & white version. Click here to print today's Bible verse for the students here (6 per page). Click here to print the teacher's Bible verse visual aid (1 per sheet). Thanks so much! I appreciate you visiting and thanks again for hosting the linky party! Thank you for sharing your wonderful ideas! I have used several of them for my Bible classes. Thank you for stopping by, Vicki! I appreciate the nice comment and I am glad that you can use some of the ideas! Thank you for hosting the kink up parties! I appreciate it! Thank you for stopping by! I appreciate the great comment! What wonderful lessons!! My daughter's Sunday School class is looking at Moses now. Thank you for sharing at Sharing Saturday!! Thanks for the nice comment! I am glad you stopped by! I would love it if you shared the blog with your daughter's teacher! Thank you so much for these wonderful lessons and handiwork. I was wondering about the arm of Moses picture, I clicked on the links, but it got a blank page. Did I do something wrong?